Tiziana Bertoncini and Thomas Lehn have been collaborating since 2002. The special feature of the duo is the alchemy created by the meeting of the classical and the electronic instrument. The different nature of sound, the characteristics and histories of violin and analogue synthesizer could recall a friction. Actually, what happens is a sort of mirror game, in which the roles of the instruments are continuously exchanged. Bertoncini and Lehn move in an abstract territory, their approach to sound is contemporary. Nevertheless their consideration to music is quite classical insofar as based principally on tension/release, rupture, intensity and expressivity in all its facets. Their first CD Horsky Park, was released in spring 2011 on British label Another Timbre. They have been performing together in Austria, Czech Republic, England, France, Germany, Italy, Netherlands, Serbia, Slovakia, Spain and Switzerland. Beside their duo work, they play in larger or extended constellations, like the ensemble]h[iatus, an international ensemble which moves in the territories of improvisation and interpretation of contemporary pieces. With this ensemble they premiered new compositions by both young and established composers like Vinko Globokar, Peter Jakober, Anthony Pateras and Jennifer Walshe. The ensemble has been playing at numerous festival of contemporary music. It has been in residence at Akademie Schloß Solitude/DE, Ferme de Villefavard/FR and Césaré Reims/FR. Césaré released the first CD of ensemble]h[iatus in January 2017 with works of Peter Jakober and improvisations. Bertoncini and Lehn have been part of multimedia projects, in which they were involved as musicians and performers. In 2015 they realized Gradients (2014), which is an interpretation of the coloured graphical score K-2591 Coloured Melody Line Composition (ca. 1925) by Miroslav Ponc, which has been published on the CD Pounding Ponc released in 2015 by the Moravská Galerie in Brno/CZ. In collaboration with ZAM Zentrum für aktuelle Musik they curated comprovise, a festival for contemporary composed and improvised music, which took place in June 2009 in Cologne supported by the german Netzwerk Neue Musik. The second edition, comprovise #2, took place in Vienna in November 2016 during Wien Modern in collaboration with the IGNM Austria. Bertoncini und Lehn veröffentlichten im Frühjahr 2011 auf dem britischen Label Another Timbre ihre erste Duo-CD Horsky Park, welche von den Rezensenten zum allergrößten Teil sehr positiv aufgenommen wurde (siehe Pressespiegel). Sie sind Gründungsmitglieder des international besetzten ensemble]h[iatus, das sich gleichgewichtig der komponierten und improvisierten Neuen Musik widmet und in enger Zusammenarbeit mit Komponisten (wie z.B. Peter Jakober, Steffen Krebber, Vinko Globokar, Jennifer Walshe, Anthony Pateras etc) Uraufführungen realisiert sowie eine Vielzahl von Repertoirewerken Neuer Musik alternierend mit Improvisationen in durchgängigen Konzertprogrammen präsentiert. Zahlreiche Festivalauftritte sowie Gastresidenzen in der Akademie Schloß Solitude/DE, dem Ferme de Villefavard/FR und Césaré Reims/FR. Eine erste CD Veröffentlichung des Ensembles mit Werken von Peter Jakober und Improvisationen wurde auf Césaré im Januar 2017 vorgelegt. In Zusammenarbeit mit ZAM Zentrum für aktuelle Musik initiierten und kuratierten sie comprovise, ein Festival für zeitgenössische improvisierte und komponierte Musik, das im Juni 2009 mit Unterstützung u.a. durch das Netzwerk Neue Musik der Bundeskulturstiftung in Köln stattgefunden hatte. Im November 2016 realisierten sie in Zusammenarbeit mit der IGNM Österreich die zweite Ausgabe des Festivals, comprovise #2, das im Rahmen von Wien Modern stattfand. The live performance of moss agate documented on this CD took place in an atrium of twenty-four containers during the dance-installation-media festival art ort. The performers were located in two open containers facing each other, equipped with sound projection systems. Moreover, the audio signal of the violin was routed into the synthesizer‘s external input to achieve a cross-effecting realtime sound processing. As several performances of different kind happened simultaniously in and around several other containers, some of the stronger „environmental“ sounds merged into this recording. galaverna, recorded in a large exhibition hall of the Triennale Bovisa in Milan, does not include any sound processing. galaverna recorded on November 11th, 2010 at Festival Pulsi, Triennale Bovisa, Milano, Italy. moss agate recorded on July 30th, 2006 at art ort Festival, Heidelberg, Germany. Recorded, mixed and mastered by Thomas Lehn and Tiziana Bertoncini. Recorded 6th-8th April 2014 at Césaré studio. Recorded, mixed and mastered by Samuel Allain, except beneden, mixed by Thomas Lehn. When approaching a graphic score like Ponc's one, the question which raises up is, if it is a pure visual art work - thus the music has to be created entirely by the interpreters - or if the visual elements represent musical parameters. Eventually, we couldn't answer to this question fully, because the informations we could find about Ponc and his music were really lacking. Therefore, we approached the score in a mixed way: regarding the datas we've found (e.g. connection between colours and pitches), referring to the graphic's proportions for time durations and “inventing” the rest (sound material, dynamics, timbres, etc.). In spite of this, the image is still represented. Their first album is one of grand gestures and big postures. [...] One can distinctly sense that these two experienced performers are not just working from "the moment", but building long suspense archs instead, sometimes replying to each other or reworking their motives from a couple of minute's distance. [...] Bertoncini and Lehn are equipped with a pair of uniquely different ears, answering rough blocks of sound with lyrical melodies or a moment of rhythmical propulsion with static harmony. [...] The most surprising feat, then, is that the music never sounds disjointed, but in fact perfectly coherent and natural. Horsky Park is an intense affair. Both musicians push at each other, challenging either with the sheer force and surprise of a sound or often the complete reverse. The interplay between the duo is both fascinating and engaging however and listening to this CD it was these elements, the tussles, the surprises, the understanding of how it all fits together on a mutual level. [...] Really great stuff, my favourite improvised album of this year so far. A surprising and intriguing encounter, which manages to overcome and integrate two different worlds, creating a new one which is equally rich and creative. [...] Lehn with his unique timbre and energy, and the idioms of composed music and the sonic research of Bertoncini, together create a singular and original universe, which is both new and refreshing. Not so much a duo of instruments, as of traditions and cultures honestly played out. What first stands out about Horsky Park is how stellar both Tiziana Bertoncini's and Thomas Lehn's playing is. Their performances on violin and analog synthesizer, respectively, are so notable that each could stand alone as a solo affair. Yet on Horsky Park, the listener is confronted by a duo, a setting wherein virtuosity is neither necessary nor necessarily admissible. Despite the pitfalls that individuality presents in group improvisation, Horsky Park in whole is as laudable as Bertoncini's and Lehn's 'solo' contributions, if not more. [...] But it's the equal-tempered fullness of their instruments that equilibrates Horsky Park, allowing two big personalities to co-habitate. And, as marvelous as each performance is, what might be most striking about this album is the duo's commensurate coexistence in sets four years apart, both temporally and aurally. Zusammen ließen Tiziana Bertoncini und Thomas Lehn die Zuhörer an ihren Klangvorstellungen teilhaben. […] Gemeinsam modellierten die Künstler eine Komposition, die sich - trotz der avancierten Umstände ihrer Entstehung - in traditionelle Formauffassungen einbetten lässt. […] Eine Musik, die aktiv gehört werden musste. Gerne mehr davon. Entgegen dem krampfhaften Eskapismus des klassischen Eiapopeia, wird da Vivaldi so in die Gegenwart gebeamt, wie es eigentlich normal wäre. Biedermeierei, die ja, gut futuristisch, die Schönheit aufheulender Autos durchaus genießt, mag das, als ob man 100% Gegenwart nicht ertragen könnte, als unschön abtun. Unsereins freut sich gerade am Reiz des Diskrepanten, am Kannibalisieren dessen, das ewig unveränderlich konserviert sein soll. At around the ten-minute mark of Galaverna, the opening half-hour-epic of Horsky Park, something extraordinary suddenly occurs: Using a tiny island of silence as her home ground, violinist Tiziana Bertoncini first paints a few emaciated brushstrokes of cool, Webern-like sparsity on the all but empty canvas of the piece, then throws herself into an extended harmonic cycle which sounds as though it had been lifted straight from a Bach partita. Even Thomas Lehn, who'd until then countered each and every of her figures with an equally witted response, seems dumbfounded by the audacity of the move, remaining silent for the entire duration of the solo, which increasingly turns into an objet trouvé, an acoustic anachronism within a sonic space spanned up by electronic crackle, subsonic swells and pingponging rhythmical synth patterns. For a full one and a half minutes, Bertoncini's web grows tighter and tighter, her fingers flying across the fretboard as the speed of her arpeggios is attaining dizzying levels. Then, as if awaking from a deep slumber, Lehn re-enters the arena, fighting fire with fire and extinguishing his partners increasingly frantic spins with a ferocious blast of analog noise. It isn't the first time their ardent personalities are coming to a passionate collision on Horsky Park and it won't be the last either. And yet, it may well be the most striking one, turning the logic of the encounter upside down and suggesting that this, their first album after an almost ten-year long release gap, is one of grand gestures and big postures. It is true that sentiments can occasionally run high with the duo and Horsy Park has undeniably turned into a work which doesn't just offer a clear sense of dramaturgy, but of drama as well – if the movies left you cold of lately, this album could turn into the cinematic revelation you've been waiting for. But it leaves just as much space for subtlety and the quietude between the notes, for moments of delicacy, refinement and even tenderness. At times, Lehn will dive into the darkest depths of his synthesizer, pitching tones down towards the borders of perception and restricting his operations to sculpting and bending their waveform. In others, he is creating translucent atmospheres made up of short-wave pulse-emissions, almost weaving together the emperor's new symphonies from all but intangible materials. Bertoncini, on the other hand, isn't just capable of strikingly mediating between the 21st century and the romantic era, of translating emotions into abstractions and back again. Sometimes, a single sustained note will be enough for her to significantly change the mood and impact of a particular scene, to support Lehn in his processings or to question, confuse and counterpoint him. Although their conflicts are almost certain to leave the most lasting memories on the first few listens, what makes their interaction so addictive for their audience are the instances which initially seem sidethoughts - but which keep haunting one long after the piece has ended. If, then, Horsky Park, as many have already reported and to which this author will readily testify as well, is a record which almost addictive qualities, then not so much so because it is immediately pleasing, but because it keeps disturbing its audience. There doesn't seem to be a clear-cut modus operandi, let alone a goal, a development, denouement or a "meaning". Even the companion piece to Galaverna - moss agate - performed in an action-packed environment of twenty-four containers at the Art Ort festival - never amounts to fully fledged concept art. And yet, one can distinctly sense that these two experienced performers are not just working from "the moment", but building long suspense archs instead, sometimes replying to each other or reworking their motives from a couple of minute's distance. On more than just one occasion, it isn't quite clear who is doing what – one of the strongest passages involves Bertoncini mimicking Lehn, who in turn seems to be mimicking an aeroplane. Which may be down to two important qualities of their duo: On the one hand, a congenial fusion of characters, as part of which Lehn is drip-fed from a infusion of Italian blood, while Bertoncini's red-hot wounds are cooled with Swiss ice packs. On the other an approach as part of which each protagonist isn't merely interacting with the other, but with himself as well – Lehn, especially, has a preference for entering into call and response games with his analogs, spreading his themes out across the stereo image and then creating constantly shifting feedback loops. Throughout, there's a fine line between reticence and holding back one's power, between talking straight and in metaphors. Importantly, however, there never seems to be a case of meta-art. The Bach-sequence mentioned in the first paragraph isn't so much a quote as it is an organic response to the challenges at hand, as much a part of the duo's vocabulary as a series of rhythmical pluckings or a chain of glistening crackle. So, too, is the opening sequence, which has an almost Mahler'ean grandeur to it, resembling the opening bars of the latter's first symphony in their otherwordly elation. Apparently, Bertoncini and Lehn are equipped with a pair of uniquely different ears, answering rough blocks of sound with lyrical melodies or a moment of rhythmical propulsion with static harmony. The most surprising feat, then, is that the music never sounds disjointed, but in fact perfectly coherent and natural. Which may explain the ongoing allure of the album: If there's a system at work here, it isn't revealing itself easily. Horsky Park is the title of the rather fine new album by Thomas Lehn and Tiziana Bertoncini, one of yet another new batch of discs on the seemingly infatigueable Another Timbre label. Lehn’s music I know very well, his work on analogue synth is, in my opinion unrivalled. Bertoncini however, an Italian violinist is a new name to me, though about of googling around informs me that she has been working in various ways with Lehn for almost a decade now. This is the fortieth AT release ‘proper’, but Lehn also appeared on one my favourites from the label, the Obdo duo with Frédéric Blondy. This one follows hot on the heels, but, as we might expect from Lehn, who is one of the most versatile and yet still consistent improvisers working today, this CD is quite different. There are two tracks, an opening piece named Galaverna that lasts half an hour and is a straight improv recording, and then Moss Agate, clocking in at thirteen minutes and apparently recorded during a “dance-installation-media festival” in Germany, the two musicians performed in separate “open containers” that faced each other, with Bertoncini’s sounds fed into an input on Lehn’s synth, and as other events took place in other nearby “containers” so some external sounds creep in. The CD begins quietly and cautiously, but quite soon the amplified violin can be heard confidently thrusting sounds at us, rasping bow strokes and firm, almost violent sounding wrenches across the strings. Around and between these attacks Lehn very cleverly drops a wide variety of sounds, from soft purrs and whines to sudden aggressive splashes and one or two thoroughly angry explosions. The violin reminds me of Luigi Nono’s composition so often, in places I hear Fragmente-Stille’s tormented struggles with language present, but it is probably the sense of harsh, vibrant musicality that pushes me that way the most, reminding me often of Nono’s more troubled, upsetting music. Galaverna is a work of some power. It isn’t clear if the recording was made in front of an audience or not, but if it was then anyone in attendance probably witnessed something quite spectacular as the music here really bursts from the stereo with real urgency, and live this would have been amplified further. Lehn is excellent on this first track. His range, and also his choices in what sounds to choose and when is so impressive. Violin wrenches will fill the foreground for a few seconds, but when they cut away they invariably leave a synth sound completely at aesthetic odds with the bowed sound, a deliberate ploy to push the music into more uncharted territory perhaps, and often in this recording there are moments when Lehn’s sounds will suddenly rise from behind something and take you completely by surprise. Galaverna isn’t quiet music, the sounds we hear literally burst from the speakers but it also sounds controlled enough and responsive enough to make the amount of consideration given to each sound one of its strongest points. Moss Agate is quite different. If Galaverna sounds aggressively forthright and energetic then the second track seems to tone much of this down, shifting to small pops and crashes, mostly from Bertoncini with Lehn laying a seemingly harmless and faintly watery composition down behind the violin. This piece is a nice counterpoint to the opening track, but it also has a slightly more spacious feel to it as sounds bounce about and reflect from one of the ‘containers’ to another. This element doesn’t always work for me and isn’t an improvement over the straight improv of the opening track, primarily because it feels like some of the raw edge of the music has been flattened a little, but its a small quibble when everything else is so addictively listenable here. Tiziana Bertoncini is a young violinist specializing in contemporary art music, improvisation and interdisciplinary events, whose musical activity is still poorly documented on disc. 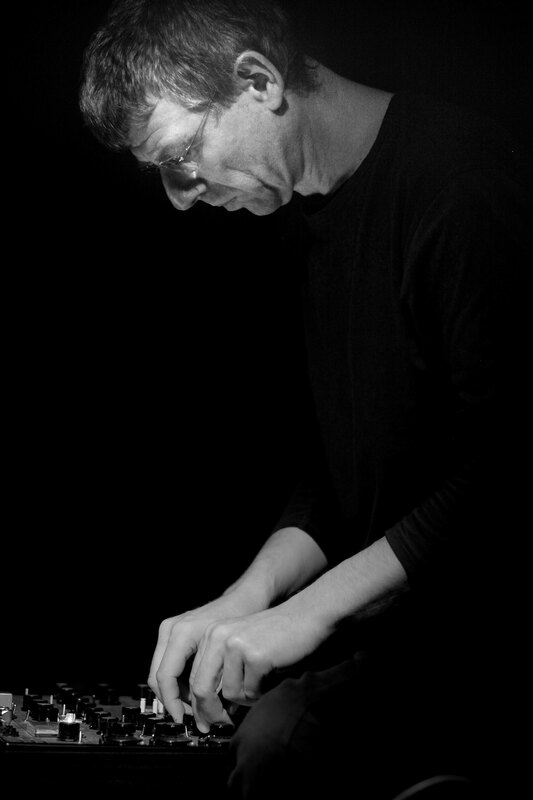 Thomas Lehn needs no introduction in my opinion, his projects and collaborations within the European and American improvised music scenes are as well-known as his rudimentary ‘old school’ approach to music. There are practically two different musical worlds meeting on this disc: a young Italian artiste and an old German geek German (or extraterrestrial being, I still have my doubts). A surprising and intriguing encounter, then, which manages to overcome and integrate these two different worlds, creating a new one which is equally rich and creative. On Horsky Park interest resides primarily in the concept of equilibrium: intensities, timbres, silence, analogue and acoustic, microtonality and tonality. There are countless alternations, numerous pauses, sensational eruptions, and various intentions and energies. Alternately or simultaneously, the violin becomes harsh, aggressive, serious, light, brital, sensitive, silent or noisy, and Thomas Lehn has to balance these different modes of playing with interruptions that are sometimes uncouth or dirty, sometimes pure and synthetic, decorative, rhythmic or melodic and so on, unless I have inverted everything. 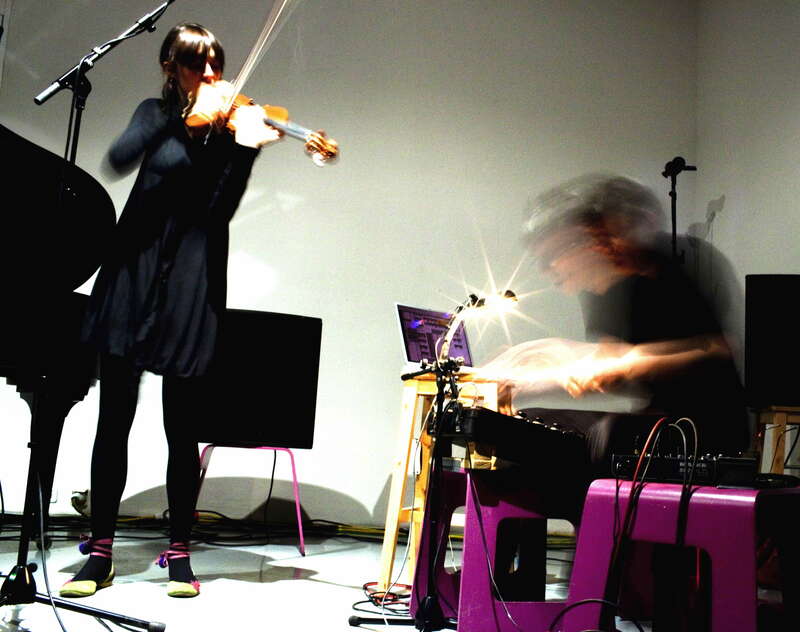 The balance is very well managed between synthesiser and violin, which oppose and confront each other whilst in the process of becoming assimilated (sometimes with a certain apprehension). The strange fact, however, is that the element that gives this duo its strength is also what constitutes its weakness, especially on the first piece Galaverna. I’ll explain: as soon as Lehn and Bertoncini achieve a balance, they do little with it; it’s constantly being broken, fractured and interrupted in the search for a new dynamic – which is sometimes frustrating and often removes the intensity of each moment of equilibrium. But seen from an overall perspective, this game of multiple short dynamics and intensities forms a sort of rhythmic energy which reinvigorates and gives a kind of consistency to the improvisations. Moreover, this multiplicity of dynamic interruptions is hugely reinforced by the extreme diversity of the two instruments and two musicians: Lehn with his unique timbre and energy (like an extraterrestrial on acid playing Pacman), and the idioms of composed music and the sonic research of Bertoncini, together create a singular and original universe, which is both new and refreshing. As becomes quickly apparent, Italian violinist Tiziana Bertoncini is classically trained. Her pool of gestural contours are rooted in string practices that date back centuries, which makes her capacity for reverse-engineering the technical knowhow engrained inside her fingers and muscular memory all the more refreshing – technique throwing her violin to the lions, not exploited to replicate the music she already knows how to play. The last thing needed in this context would be a second layer of instrumental pyrotechnics. MIMEO and Konk Pack keyboardist Thomas Lehn sticks to his analogue synthesiser and about ten minutes into the half-hour opening piece “Galaverna”, the duo confront that stylistic elephant in the room: the structure snaps as Bertoncini's figurations chance on some explicitly neo-Baroque arpeggios and Lehn reboots the momentum with voluble, purring glissando shapes. But I wouldn't want to give the impression that Horsky Park is only about stylistic disjoints. In fact Bertoncini sounds happiest when manipulating her technical dexterity to make the violin unstable – messing with transitory, flaky notes in the unpredictable upper register and scooping sound-masses from her violin's midriff by pressing the bow down 'too' hard. Lehn responds with sounds that are purposefully synthetic and nothing to do with the instrumental grain: not so much a duo of instruments, as of traditions and cultures honestly played out. What first stands out about Horsky Park is how stellar both Tiziana Bertoncini's and Thomas Lehn's playing is. Their performances on violin and analog synthesizer, respectively, are so notable that each could stand alone as a solo affair. Yet on Horsky Park, the listener is confronted by a duo, a setting wherein virtuosity is neither necessary nor necessarily admissible. Despite the pitfalls that individuality presents in group improvisation, Horsky Park in whole is as laudable as Bertoncini's and Lehn's 'solo' contributions, if not more. Recorded at Festival Pulsi, Triennale Bovisa last July ("galaverna") and the festival Art Ort in 2006 ("moss agate"), Horsky Park is the documentation of two sonically and technically distinct pieces that are nonetheless thematically akin. In both "galaverna" and "moss agate", Bertoncini's violin asserts an aural leading role, often evolving in directions that allude to composed/notated idioms. With Bertoncini's direction, Lehn's synthesizer frequently interjects in a reactionary role, engaging in call-response motifs and direct re-appropriation of Bertoncini's sounds. But contrary to the subservient possibilities of this dominance, there is a balance between the two instruments that suggests a heftier engagement on Lehn's part than intimated by an aural glance. Indeed, Lehn's manipulations in "moss agate" provide much of the separation between the two sets. The chronological first track "moss agate" is characterized by Lehn's reinterpretation of Bertoncini's violin, hijacking the audio signal from the violin, "rout[ing it] into the synthesizer's external input to achieve a cross-effecting realtime sound processing." Lehn's technique is used to great effect, generating an eerie cyclic structure that perfectly complements Bertoncini's percussive approach and the festival ambiance captured in the recording. Contrasted by the Lachenmann-esque plucking of "moss agate", Bertoncini's playing on "galaverna" employs longer durations and melodic contours. Still stylistically indebted to notated music, Bertoncini's playing instead resembles Berio's Sequenza VIII, a refreshing departure from the sorts of string playing often found in improvised music. Supporting and subverting these violin manifolds is Lehn, who, while often dormant, deftly prods with his synthesizer. Sometimes inserting near humorous tonality, sometimes bursting with violent shouts, Lehn's instrument is rich in character on "galaverna". But it's the equal-tempered fullness of their instruments that equilibrates Horsky Park, allowing two big personalities to co-habitate. And, as marvelous as each performance is, what might be most striking about this album is the duo's commensurate coexistence in sets four years apart, both temporally and aurally. I wonder if Tiziana Bertoncini (violin) is the daughter of Mario Bertonincini, the pianist who plays modern classical music. Here she teams up with Thomas Lehn (analogue synthesizer), in two recordings. The first is from 2006 and the second is from 2010. The latter has some complex linking together of the violin output to the synthesizer. It lasts thirteen minutes, while the 'unprocessed' one is about thirty minutes. Two entirely different instruments of course, with totally different techniques to play them, tonal qualities and it is curious to hear them together. I must admit this really works well. Especially in the long piece 'Galaverna' there is some great tension going on between the bursting electronic/electric connections of Lehn and the intense playing of Bertonincini. Bouncing in all directions, soft versus loud, noise versus traditional classical approach, its all passing with seemingly great ease. Tiziana Bertoncini est une jeune violoniste spécialisée dans la musique savante contemporaine, l'improvisation et les rencontres interdisciplinaires, dont l'activité musicale est encore peu documentée en enregistrements. Thomas Lehn n'a pas besoin d'introduction à mon avis, ses projets et ses collaborations au sein de la musique improvisée européenne et américaine sont aussi connus que son approche rudimentaire et old school de la musique. Ce sont presque deux mondes qui se rencontrent sur ce disque: une jeune artiste italienne et un vieux geek allemand (ou extraterrestre, j'ai toujours des doutes). Une rencontre surprenante et intrigante donc, car elle a réellement su dépasser et intégrer ces univers pour en former un nouveau, également riche et créatif. Sur Horsky Park, l'intérêt repose en grande partie sur la notion d'équilibre: des intensités, des timbres, du silence, de l'analogique et de l'acoustique, de la microtonalité et de la tonalité. Il y a de nombreuses alternances, de nombreuses pauses, des ruptures fracassantes, des intentions et des énergies variées. Tour à tour ou simultanément, le violon se fait rauque, agressif, grave, léger, brut, sensible, silencieux ou bruyant; et à Thomas Lehn donc d'équilibrer ces modes de jeux avec des interruptions parfois rustres et sales, ou pures et synthétiques, décoratrices, rythmiques ou mélodiques, etc. à moins que je n'ai tout inversé. L'équilibre est très bien géré entre le synthétiseur et le violon qui s'opposent autant qu'ils se confrontent tout en s'assimilant (comme avec appréhension parfois). Fait étrange cependant, c'est que ce qui fait la force de ce duo, tout particulièrement sur Galaverna, en constitue aussi la faiblesse. Je m'explique: dès que Lehn et Bertoncini trouvent un équilibre, ils n'en font que peu de choses, il est sans cesse rompu, brisé et fracturé pour partir à la recherche d'une nouvelle dynamique, ce qui est parfois frustrant, et ne manque pas, souvent, d'ôter de l'intensité à chaque forme d'équilibre. Mais ce jeu de dynamiques et d'intensités courtes et multiples, d'un point de vue plus global, forme aussi, petit à petit, une sorte de rythme et d'énergie qui redonne de la vigueur et de la consistance à ces improvisations. De plus, cette multiplicité de fractures dynamiques est énormément renforcée par la diversité des origines et des instruments des deux musiciens; Lehn, avec son timbre et son énergie si particuliers (proche d'un extraterrestre sous acide qui jouerait à Pacman), les idiomes issus de la tradition écrite ou non et les recherches sonores de Bertoncini, tout ceci forme un univers très singulier et original, neuf et rafraîchissant. Chacun est venu muni de son bagage instrumental, de son passé musical, de ses recherches et de ses trouvailles, et Horsky Park a su conserver toutes ces histoires pour en former une troisième issue de leur rencontre, un troisième univers où des connections improbables peuvent se tisser sans difficulté. Deux pièces riches en trouvailles sonores et dynamiques, centrées sur une interactivité marquée par l'urgence et la réactivité spontanée, deux pièces pleines de désirs et de vitalité. Ainsi Tiziana Bertoncini a, auprès de Thomas Lehn, perdu en devenir ce qu’elle a gagné en indépendance. L’exposition des deux tableaux qui attestent cette évolution est heureuse et manifeste. Tiziana Bertoncini, Geigerin im Niemandsland der Comprovisation, und Thomas Lehn, umtriebiger Hansdampf am Analogsynthesizer, kennen sich aus dem ensemble]h[iatus. Seit 2002 spielen sie auch im Duo zusammen. Horsky Park (at40) besteht zum größeren Teil aus 'galaverna' ('Raureif'). Entgegen dem krampfhaften Eskapismus des klassischen Eiapopeia, wird da Vivaldi so in die Gegenwart gebeamt, wie es eigentlich normal wäre. Biedermeierei, die ja, gut futuristisch, die Schönheit aufheulender Autos durchaus genießt, mag das, als ob man 100% Gegenwart nicht ertragen könnte, als unschön abtun. Unsereins freut sich gerade am Reiz des Diskrepanten, am Kannibalisieren dessen, das ewig unveränderlich konserviert sein soll. Die beraureifte Geige, die einerseits bewusst das Wintergezitter aus den Vier Jahreszeiten anklingen lässt, andererseits aber fast gegen ihre Bestimmung als toughe Zeitgenossin ungeahnte Krallen ausfährt, und die Lehnsche Knatter- und Zwitscherbox sind zwangsläufig ein seltsames Pärchen. Aber statt dem alten 'Die Schöne und das Biest' inszenieren sie ein modernistisches Spiel – 'Das Biest und der Geist in der Maschine'. Das wird noch deutlicher bei 'moss agate'. Entstanden als Performance vis-a-vis in zwei Con­tainern, wurde dabei der Geigenklang auch in Real-Time-Proccessing zerklang­wolft. Dabei hat Bertoncini bereits allen romantischen und harmonischen Muff abgestreift. Sprödes Pizzikato, schrille Striche, sportliche Bogenschläge ver­wandeln die schnörkelige Geige in eine kakophone Klangmaschine, ein Intona­rumori. Statt Canaletto Russolo. Lehn interagiert als industrialer Widerpart, mit scheinbar dampfbetriebener Mechanik, dann als ultramoderne Blackbox und als Transformator. So - oder so ähnlich - hält man auf dem Markt der Trödler den Gedanken wach, dass Museen nur an Allerseelen geöffnet sein sollten. Skivan har två spår. Den halvtimmeslånga "Galaverna" är inspelad i en utställningshall i Milano 2010. Musiken bor i ett stort rum med högt till tak. Lehn fyller med med sina syntböljor och Bertoncini surfar på topparna, skär genom ytan med sin fantastiska teknik. Det är inte tråkigt en sekund. Snarare ett magpirrande äventyr att följa de två. Och sällan har två ljudbilder så gärna gift sig med varandra som här, då violin och synth möts. Andra stycket, "Moss Agate", är kortare och hämtat från en live performance i Heidelberg 2006, där spelarna inte delade rum direkt utan huserade i var sin container. Föreställningen innehöll, vad jag förstår, mycket mer än enbart en duo mellan Bertoncini och Lehn. Dokonalou symbiózu pøedvádìjí na opusu Horsky Park také italská houslistka Tiziana Bertoncini a vìhlasný nìmecký hráè na analogový syntezátor Thomas Lehn. Zdánlivá mesaliance dvou „nesluèitelných“ nástrojù pøináší naopak kongeniální prùnik akustického a elektronického svìta a pøedstavuje nadèasovou rovinu, kde se v houslových partech taví reminiscence na pøedešlá století s neofuturistickými eskapádami. Ústrojná hráèská bravura houslistky tak „ladí“ se syntetickými zvuky non plus ultra. Lehn sice dává prùchod i své plíživé výbušnosti, ale rozhodnì nepøeválcovává drsné i jemné trylky své kolegynì. Vzniká tak úžasné napìtí, nikoliv však nepøíjemná tenze. Místy jistì velmi expresivní dílo, ale na druhou i pohlazení „balsamico“. Vlastnì mì napadá, že se tady svým zpùsobem støetává a zároveò souzní nìmecká strojovost a italská impulsivnost, pøièemž bych ovšem Thomase rozhodnì nechtìl naøknout z nìjakého „germánského chladu“. Ten je mu dozajista cizí. Tiziana Bertoncini graduated in classical violin at Siena Conservatory and painting at the Fine Arts’ Academy in Carrara. After being playing in orchestras and chamber music ensembles, she focused on contemporary music, written and improvised. She performed in many international contexts and festivals and has been part of numerous dance, theatre, video and multi-media projects, contributing the musical part of them. 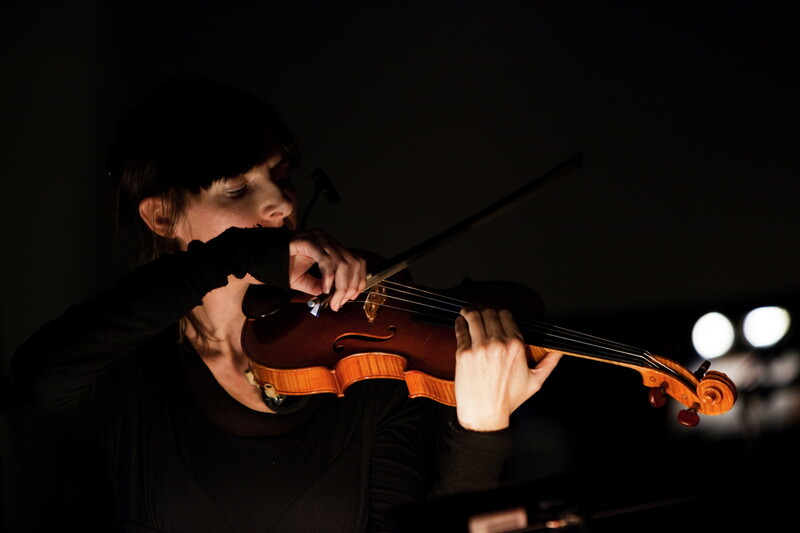 In 2011 her electro-acoustic composition Nur Sand was awarded at the competition Ferrari (r)écouté called by hr2-kultur and the ZKM | Institute for Music and Acoustics. The piece has been published in the compilation CD JETZT on the label Wergo. 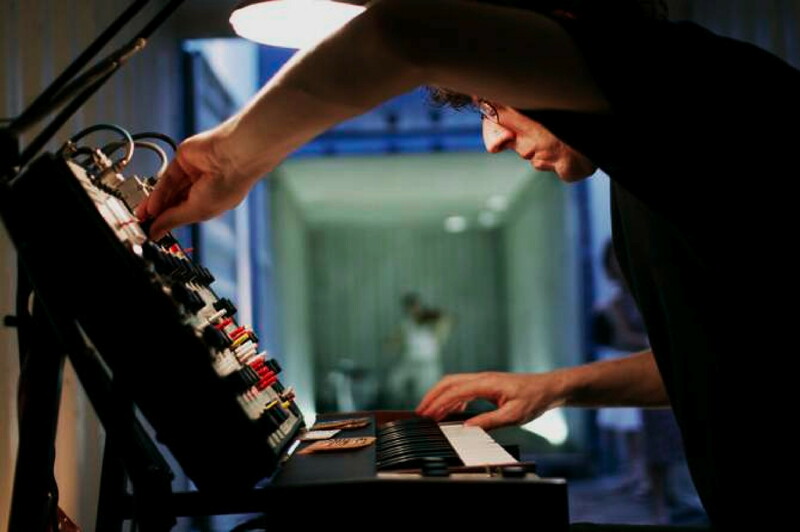 Thomas Lehn is a pianist, analogue synthesizer player and a composer-performer of contemporary music. His academic education enfolds studies of recording engineering at the Hochschule für Musik Detmold in Germany in 1979-1980 as well as classical and as jazz piano at the Hochschule für Musik und Tanz in Cologne 1980-1987. During the 80ies he repeatedly took part on courses of Studio for pianistic interpretation held by Prof. Jürgen Uhde as well as courses of New Music in Darmstadt. Since the 1980s he has been performing as an interpreting pianist, both, contemporary new music including numerous first performances and traditional composed music of the classical/romantical period, however as well in jazz and rock bands, music theatre and performance projects. Parallel to this work as a pianist, since the early 1990s he extensively developed activities in international colloborations as a performer of live-electronic music based on the sound synthesis of analogue synthesizers of the late 1960s, utilizing almost exclusively the EMS Synthi A. In 2000 his solo album Feldstärken has been released on German label Random Acoustics. Performing majorly his own electronic music, he has been extending his work by live- and studio-produced synthesizer interpretations of electronic compositions by composers like Boguslav Schaeffer, Éliane Radigue, Peter Jakober, Anthony Pateras a.m.o. . The realisation of Boguslav Schaeffer's Electronic Symphony has been documented on the CD PRES Scores on polish label Bolt/Monotype. In 2012 he premierred as soloist OCCAM VI for synthesizer solo by Éliane Radigue at Berghain Berlin during festival Faithful! and – together with KlangForum Wien – dort for synthesizer and 15 piece ensemble by austrian composer Peter Jakober at musikprotokoll Graz and at Konzerthaus Vienna. International collaborations enclosure long term and newer ensembles as well as involvements in numerous specific projects employing either merely music, or, music in combination with other artistic practices (dance, film, video, multimedia, performance etc.). Long term working ensembles include the trios KONK PACK, TOOT, THERMAL, the duos works with Marcus Schmickler, Tiziana Bertoncini, Gerry Hemingway, Paul Lovens, Frédéric Blondy Urs Leimgruber and John Butcher, as well as other formations like MIMEO, SPEAK EASY, SHIFT, 6IX, a.mo. . Furthermore, he is pianist and founding member of the ensemble]h[iatus, a project dedicated to the both practices of interpratation and improvisation. More recently established ensembles are the duos with the video artist Kjell Bjørgeengen and percussionist Roger Turner, as well as two trio formations shared together with John Butcher involving the pianists John Tilbury and Matthew Shipp. Thomas Lehn has been touring in Australia, Austria, Belgium, Canada, Croatia, Czech Republic, Denmark, England, Finland, France, Germany, Hungaria, Ireland, Israel, Italy, Japan, Latvia, Lebanon, Netherlands, New Zealand, Norway, Poland, Portugal, Russia, Serbia, Scotland, Slovakia, Slovenia, Spain and Sweden. He has been involved in projects promoted and/or supported by the Goethe-Institutes in Beirut, Belgrade, Bratislava, Budapest, Chicago, Copenhagen, Glasgow, Lille, Lissabon, London, Manchester, Marseille, Milano, Montreal, Moscow, Palermo, Riga, Rome, Tel Aviv, Tokyo, Toronto, Warsaw, Wellington and York.